LAST month, Ipoh-based public transport service provider Perak Transit Bhd terminated a conditional share subscription agreement with Australian banking group Macquarie Bank Ltd. According to the agreement, which was signed on Feb 8, Macquarie Bank was entitled to subscribe for up to 125 million placement shares of Perak Transit, which may be issued in multiple tranches at any time within six months until August. The deal was part of a corporate exercise to raise up to RM49.38 million — largely to repay bank borrowings and to settle an outstanding balance for two land acquisitions it made last year — by issuing 182.87 million placement shares, which represent about 10% of its enlarged share capital of 1.83 billion shares. However, Macquarie Bank only managed to subscribe for 10 million shares in three tranches between February and March, before the share subscription deal was unilaterally called off by Perak Transit last month. Under the agreement, Macquarie Bank could enjoy a discount of no more than 10% on the five-day volume weighted average market price of Perak Transit’s shares. Market talk has it that in a move to rake in some quick profit, the bank had disposed of the shares shortly after it received them. The sales had depressed Perak Transit’s share price. Year to date, the counter has declined 9%. It closed at 25.5 sen last Thursday, giving the company a market capitalisation of RM323.2 million. The stock hit a peak of 31 sen on Feb 23. Perak Transit was rumoured to have been caught by surprise by the Australian banking group’s decision, which resulted in an overhang in the stock. When contacted, Perak Transit chief financial officer John Loh Kwang Yean refutes the speculation that the relationship between the two companies has turned sour, stressing that the termination of the agreement was “purely a business decision”. He says when the discussion was held at the end of last year, the market sentiment was still good. Thus, Perak Transit and Macquarie Bank struck the deal with a floor price of 25 sen per share. Unfortunately, the market softened after the agreement was signed, causing the subscription price-after-discount to breach the floor price. In other words, Macquarie Bank could not exercise its right to subscribe for Perak Transit’s shares. “It could not subscribe for the remaining [115 million] shares. We found that the deal was not fruitful and could not serve its purpose. Since the six-month timeframe was coming up [and] we were neither here nor there, we decided to end the agreement,” Loh tells The Edge over the phone. “If the market had been bullish, we could have placed out the shares to Macquarie Bank as fast as we could. But at the current price, we don’t want to sell too cheaply to it, and it can’t buy at below 25 sen anyway,” he explains. Loh says the company’s adviser, TA Securities, will continue to seek new investors to subscribe for the remaining shares, while Perak Transit is also looking on its own. In the conditional share subscription agreement, it was noted that an early termination fee of RM80,000 would apply if Perak Transit unilaterally elected to terminate the agreement before 20% of the subscription’s total could be reached. Such a fee would constitute reimbursement for the costs, including but not limited to the external legal and due diligence costs incurred by the investor in connection with the transactions. Loh stresses that there are no hard feelings or disputes between Perak Transit, Macquarie Bank and TA Securities, adding that the deal was done on a willing buyer-willing seller basis, and all three parties still respect each other. “We were very happy that Macquarie Bank wanted to subscribe for our shares. To put it bluntly, it wanted to give us money. But along the way, we realised that the market condition did not allow us to continue this programme, and it fully understood our situation. If we had a chance to do it again, we would,” he says. Interestingly, Loh did not blame Macquarie Bank for the stock overhang, but he acknowledges that the selldown by the Australian bank had indirectly dampened the performance of its share price due to negative perception. Loh says based on the amount of shares that Macquarie Bank has sold, he doubts that the sale weighed on Perak Transit’s share price. But like it or not, Macquarie Bank’s move may have created uncertainties about the company’s share price, leading investors to wonder when the foreign bank would clear its position. Loh admits that the earlier-than-expected selldown by Macquarie Bank was something “beyond the company’s control”, and the bank had a right to do so. 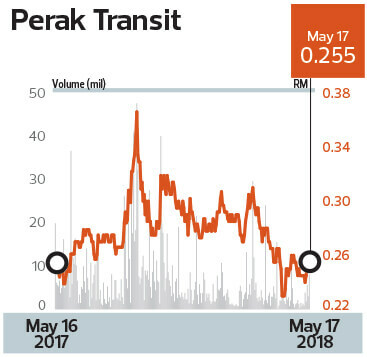 On a positive note, with the overhang on its share price removed, Perak Transit’s stock should be able to move more freely from now on. TA Securities senior investment analyst Tan Kam Meng opines that the termination of the share subscription agreement will do more good than harm to the share price of Perak Transit, without elaborating. “Perak Transit’s fundamentals remain solid and its FY2018 profit will be boosted by positive rental reversion at Terminal Amanjaya for both the promotional areas and advertising spaces. Besides that, the construction of Terminal Kampar is on track and the new bus terminal is scheduled to commence operations by end-2018,” he tells The Edge in an email. Perak Transit made its debut on the ACE Market at 15 sen apiece in October 2016. The company plans to migrate to the Main Market by July or August this year to enhance its visibility and gain wider investor recognition. Despite being an ACE Market company, Perak Transit has already attracted a number of institutional investors, including Phillip Capital Management Sdn Bhd, some unit trust funds under RHB Asset Management Sdn Bhd as well as low-profile businessman Tan Sri Richard Koh Kin Lip.